Get your party started with these amazing apps. 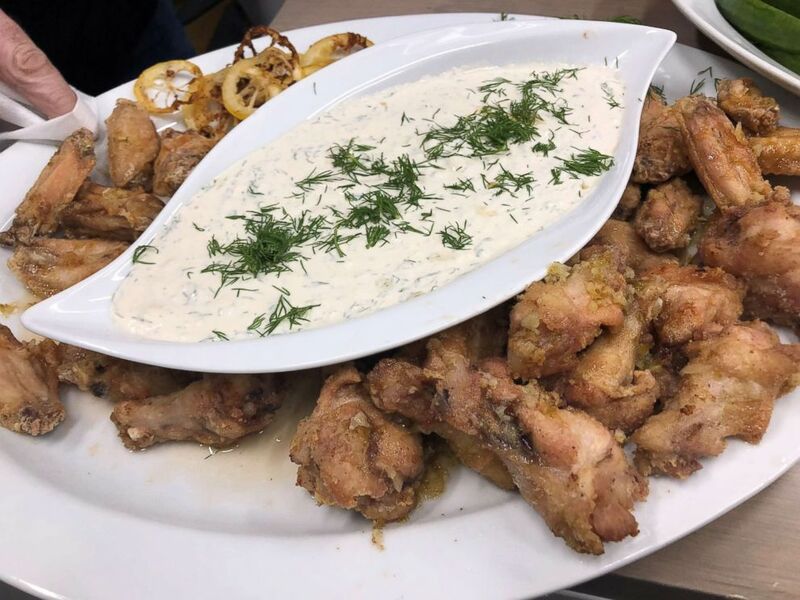 Celebrity chef and Food Network personalities Alex Guarnaschelli and Jeff Mauro cooked up their twists on one of the classic Super Bowl foods -- chicken wings. 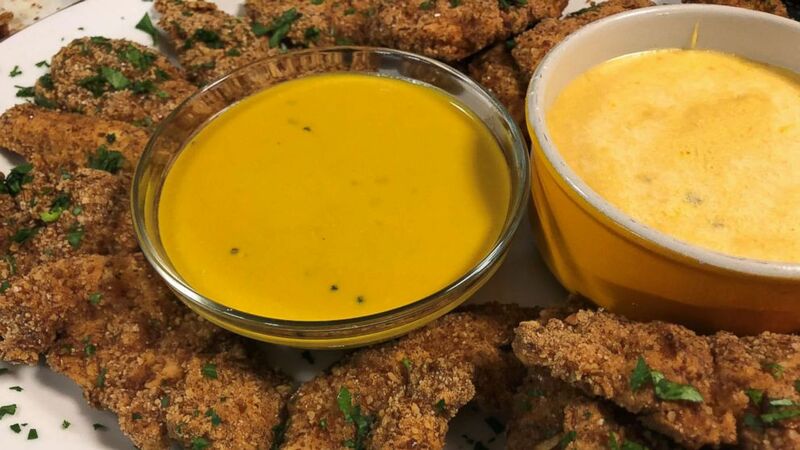 The "Chopped" judge dished her sweet and sour wings with quick cucumber "pickles" like that of a deli half sour, while "The Kitchen" host and sandwich king opted for the controversial "boneless" variety with pretzel coating and beer cheese sauce. 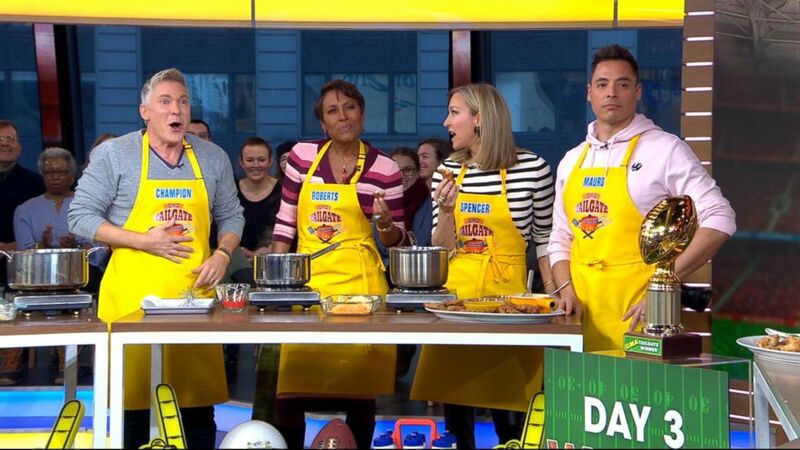 The chefs demonstrated how to put it all together on "Good Morning America" today -- get the full recipes below. Sweet and Sour Chicken Wings with Garlicky Ranch and Quick Cucumber "Pickles"
(ABC News) Alex Guarnaschelli's sweet and sour wings with ranch dipping sauce. 8 smallish cucumbers, each cut lengthwise into 4 “spears"
24 chicken wings (about 41/2 pounds), each wing into three pieces. Set aside the wing tips for stock. To make the pickles, simmer the sea salt and apple cider vinegar in a medium pot with eight cups water until salt dissolves. Add the dill and cool 15 minutes. Arrange the cucumbers upright in a container and cover with brine. The cucumbers should fit tightly and come within half-inch of the top of the container. Cover. Refrigerate 45 minutes and up to two days. To make the dressing, whisk together the sour cream, mayonnaise and buttermilk in a large bowl with the Worcestershire, garlic powder, hot sauce, 2 teaspoons salt, dill and blue cheese. Taste for seasoning. Set aside. To make the sweet and sour sauce, bring the honey to a simmer in a medium pot over medium heat and cook until golden brown, three to five minutes. Remove the pot from the heat and carefully add the vinegar, hot sauce, a pinch salt and the garlic and simmer gently, three to five minutes. Stir in zest. Keep warm. To fry the chicken, preheat oven to 350 degrees. Pour the oil into a deep, heavy-bottomed pot. Heat the oil to 350 degrees over medium heat. Prepare a baking sheet fitted with a kitchen towel and a slotted spoon. In a large bowl, combine the flour and cornstarch. Season the chicken wings with salt and toss in the flour mix. Shake off excess. Drop about a quarter of the chicken into the oil and gently “swirl” the oil as they fry. This swirling will assure they fry more evenly on all sides. When they are light to medium brown, five to seven minutes, remove them with the spoon and lay them out on the kitchen towel to cool. Season with salt. Repeat until all are cooked. Fry the lemon slices until crispy. Finish cooking in the oven 10 minutes. To finish, drizzle the honey sauce over the chicken and top with the fried lemon. Serve with the cucumbers and Ranch dressing on the side. (ABC News) Jeff Mauro's boneless pretzel coated wings with beer cheese dipping sauce. Place chicken in a zipper-top bag with about a half cup of Liquid Gold Mustard sauce. Marinate for at least two hours or up to eight hours. Preheat oven to 450 degrees or preheat fryer to 350 degrees. Take chicken out of mustard. Dip into flour, then dip into egg, then coat entirely in pulverized pretzels. Place on wire-racked sheet pan sprayed with non-stick cooking spray. Bake for 12-14 minutes or until internal temp registers 165 degrees. If frying, place chicken gently into oil and fry in two to three batches for four to five minutes or until golden and internal temp reaches 165 degrees. Top with chopped parsley and Serve with Liquid Gold Sauce and a side of Beer Cheese Sauce. Set a medium sauce pan to low heat. Add in evaporated milk, Beer and Dijon and whisk together until uniform and smooth. Toss grated cheese and cornstarch together in a bowl until totally coated. Whisk in cheese and heat, stirring constantly, for about five minutes until all the cheese is melted and the sauce is silky and smooth. Add ingredients into a small pot and bring to a simmer while constantly whisking. Lightly simmer for five minutes or until sugar is dissolved.